How Stupid Can America Be? Pretty damn stupid according to a new report by the United States International Trade Commission. In 2009, the United States lost $48 billion dollars and 923,000 jobs due to brazen theft by China. Yet, companies routinely think the great answer is to manufacture in China, due to lower costs. How can getting your product and design ripped off, with a knock-off, at least 30% cheaper than your own product appearing on store shelves, help a company increase their profit margins? As U.S. and other manufacturers moved their manufacturing operations abroad to Asia and other regions, opportunities for counterfeiting increased from the standpoint of both the production process and the import supply chain. In other words, those companies who funneled billions in new investment dollars to China, moved their manufacturing and business there, are much more likely to be ripped off. Others heavily targeted are those manufacturers with high value trademarks, such as Prada and Nike. 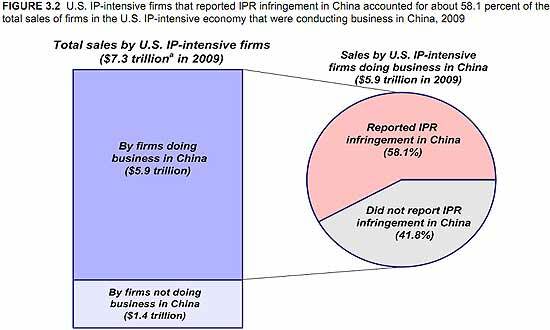 Below is a graph showing firms that reported intellectual property infringement were 58.1% of the 2009 China sales by U.S. intellectual property intensive businesses. So, in other words, companies targeted are large, multinationals, doing business in China and outsourcing. Technical innovation is responsible for 75% of the U.S. economic growth since the 1940's. Now one must assume this means the resulting production spawned is located in the U.S. from that U.S. Department of Commerce statistic. 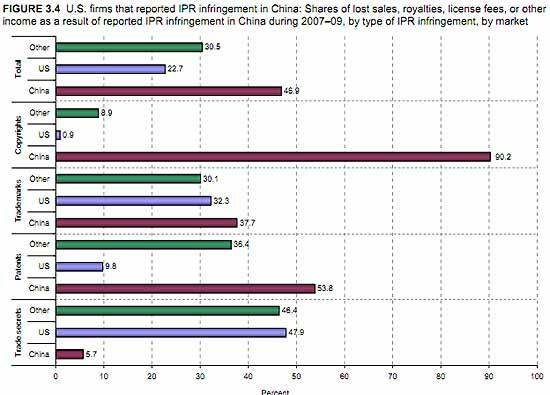 Just how important IPR is, to the U.S. economy, in spite of this grand theft auto copyrights & patents game from China, the United States still ran a $64.6 billion trade surplus for royalties and licensing fees in 2009. Yet, look at the response by U.S. corporations to combat theft. Pulling out of China? No. Hiring Americans who are loyal to the nation? No. Lowering their own prices? Yes. U.S. corporations are literally are competing against their own designs and products. There is literally no investment, planning, research and development to manufacture a ripoff clone. U.S. firms also reported lower revenues because they lowered their prices in the China market or reduced the number of products they sold in that market, thereby also possibly losing market share in China. This is another problem with the great mythical 1.3 billion person consumer market, one is going to have to lower their prices in order to compete in those markets, a point not often analyzed. The type of intellectual property stolen in China is copyrights. Software is covered under copyright most often. The footnotes state 79% of all software installed in China in 2009 was ripped off. This appears to be from a user view as well as stealing firmware and software for product clones. Beyond this report, China has a so called indigenous innovation policy. This amounts to demanding intellectual property be developed by Chinese engineers and scientists and America can....go do something to itself. Not only is China ripping off America, they are demanding that intellectual property recognized in China be developed....by the Chinese. How buy American and hire America is that? Unfortunately the wrong country is enacting it. There is quite a bit of testimony in the report. What is astounding is the number of so called experts in pure denial over the loss of intellectual property and corresponding revenues in China. One literally tried to claim it's all good because somehow enabling theft fosters Democracy. Good God. Most of the loss of American jobs in manufacturing was due to improvement in productivity - translated, the manufacturers figured out how to use less labor. The balance, was due to the use of lower cost labor offshore, and it was not something unique to China. If those jobs did not go to China, they would have gone somewhere else with low cost labor anyways. Putting it in perspective, For over 20 years, China had been the biggest benefactor to Americans. Affordable goods of high quality held inflation low and raised the living standards for all American consumers, recycling of trade dollars kept American interest rates next to nothing. As a direct result, American asset prices kept rising steadily. Unemployment was never a real problem for the entire generation (20 years!! ), and everyone had extra money to spend. Those were the golden years - until the 2008 meltdown/recession caused by the fraud of the American banksters (which killed 8 million American jobs). Even after the debacle, Beijing stood by America, refused Putin's advances to assault the American financial system, and continued to buy Treasuries and GSEs. thereby propping up the rickety American financial system. China wanted to see a strong and stable America, where folks have jobs and can afford to buy more products from China. It is really hard to comprehend HOW gifting away goods at low prices is hurtful to the recipients. As Hu pointed out in his visit, Americans annually saved at least $60 Billion due to the well priced Made in China goods. Today the economic relationship between China and America is grotesquely unbalanced - IN FAVOR of America on almost all counts. One outrageous trend is that the major U.S. corporations are seeking to legalize theft of IP from Chinese suppliers. It is well known that in the "standard" vendor contracts from major U.S. importers (all the big names), they all contain PREDATORY clauses (a) taking the trade secrets and confidential info of the China exporters without extra compensation while obligating the China exporters to honor the counterpart of the U.S. importer; and (b) clause that says once the vendor supplies the product to the COMPANY for a while (e.g., 1 year), then the COMPANY (the U.S. behemoth) would be granted a PAID UP, ROYALTY FREE license on all the IP of the Chinese exporter, until the end of time (or end of life of the IP). Given the unequal bargaining positions of U.S. behemoths and the tiny Chinese suppliers, this open theft of Chinese created IP through the use of contracts of adhesion, simply cannot be effectively countered by the small Chinese exporters. IMAGINE clauses like that being imposed by ANY Chinese company on the likes of American companies - Microsoft, Intel, GE, etc., and see fire and brimstone responses from Washington!! Too bad Beijing has not wised up to this travesty, and has done nothing to help the Chinese exporters yet, leading to the loss of likely hundreds of billions of dollars in Chinese IP through this predatory practice by major Western companies. What is good must be universal. If IP is to be protected, ALL IP should be protected. No, we have a good 3 million jobs, directly tabulated, as a loss due to China. (Scott, Robert EPI), then if one looks at productivity, that's also bunk because there is some new research which shows outsourcing, that's stealing American jobs, is impacting not only productivity equations, but also phantom GDP. In fact I was going to write up a post overviewing some of this research out of the BEA and other economists. the domestic IP theft, while inside the U.S., is also well documented. How Do US Companies Find Out Chinese Secrets? If the Chinese companies manufacture goods, then how are Amricans in any position to find out any secrets of Chinese manufacturers? On the other hand, it seems to me that Chinese manufacturers have daily access to all the details involved in American companies' products. The Chinese manufacturer could easily make copies of American products, slap a Chinese label on it and sell it as their own product. One area of outright inequity in the trade between America and China is IP THEFT. Supplier shall not at any time, during or after the Term of this Agreement, disclose to others, take or use for its own purposes or the purpose of others, any of Company’s confidential information, knowledge, designs, data, know-how, trade secrets, or any other information considered “confidential” or “proprietary” by Company. Supplier understands, agrees and recognizes that this obligation applies, but is not limited to, technical information, designs, marketing and financial information, and any business information that Company treats as confidential. Any confidential information, knowledge, designs, data, know-how, trade secrets, or any other information considered “confidential” or “proprietary” by Supplier which the Supplier shall have disclosed or may hereafter disclose to the Company and which in any way relates to the goods or services covered by this order, agreement or contract, shall, unless otherwise specifically agreed to in writing by the Company be deemed to be confidential or proprietary information and further shall be acquired by the Company free from any restrictions (other than a claim for patent infringement) as part of the consideration for this order, agreement or contract. No cause of action will arise on Supplier’s behalf for Company’s use of any confidential information disclosed to Company, and no damages whatsoever shall accrue to Supplier for Company’s use thereof. Supplier shall keep confidential any and all technical processes and information, economic and financial information, designs, data, marketing information, and any other business information that Company treats as confidential furnished to Supplier in connection with this order, agreement or contract and Supplier shall not divulge, export or use directly or indirectly, such information for the benefit of any other party without obtaining Company’s written permission. Supplier shall return all items belonging to Company and all copies of documents containing such confidential information in Supplier’s possession or under Supplier’s control upon request by the Company or termination of this Agreement." Absent a separate express agreement between Supplier and Company and after one year from date of importation of Merchandise into the United States which in any way relates to the goods or services covered by an Order, , Supplier will irrevocably grant to Company a full paid up, royalty free license to make, use, sell and offer for sale any such Merchandise free of any claim of infringement or misappropriation of any intellectual property of Supplier. The aforementioned paid up license will remain in effect until the expiration of any intellectual property relating in any way to the Merchandise." Can you imagine clauses like that imposed on Microsoft, or Intel, etc., by any Chinese entity without causing a fire and brimstone response?? Yet this sort of chicanery is imposed by major American companies in contracts of adhesion on hundreds of thousands of Chinese exporters year in and year out. The typical Chinese company simply is not in a position to bargain. As a result, China had been ROBBED of hundreds of billions of dollars of valuable IP over the decades. What is good must be universal. If IP is to be protected, everyone’s IP should be protected. Hello, there is nothing wrong with this contract language. On what planet makes you think just because some firm manufactures, magically they can benefit beyond deliverables of the finished product? Of course they cannot. Your attitude is typifying what is wrong. Absolutely Microsoft and Intel would sign something of this nature, if they were manufacturers, but they are not, they are the owners/designers. It's their R&D, which they spent billions in developing. That's the point. If we create new products in the US and manufacture them here too, that should eliminate your complaints. It would also solve our high unemployment problem. Please advise the Chinese government that the best solution to this problem is for them to forbid all manufacturing in China by American companies. Don't delay. Kick all the Americans out by 2013. If you want, you can stop your students from getting their technical MS and PhD degrees here too. Then all the ideas you have can be developed by you. And all the ideas we have can be developed by us, right here in America, by Americans. WHY do you think Chinese average export has a 2.5% profit? It is because the Chinese had been ROBBED BLIND with these contracts of adhesion. The normal profit with IP should be 15%. You do the math, on how much the Americans had stolen from the Chinese in IP. It is indeed 100% true that the trade between America and China is HIGHLY INEQUITABLE. There should definitely be a BALANCE OF PROFITS, by edict if necessary. By June, 2009, the total number of U.S. investment projects in China had exceeded 57,000 and the value of accumulated U.S. investment in China reached 61 billion dollars. These U.S. companies operating in China REPORT annual profits of at least 80 BILLION U.S. dollars. The actual profits are of course much higher, as they are hidden with transfer pricing moves. According to the American Chamber of Commerce in China’s 2009 White Paper, about 74 percent of American businesses in China made profits and 91 percent chose to stay in China to expand their business. Many of these businesses are enjoying not only whatever industrial policies promulgated by Beijing, but they are also enjoying preferred status, advantaged over the locals. On the other hand, cumulated Chinese direct investments in the U.S., due to the hostility shown by the American Congress, has been only US$3.1 Billion by June 2009. The $80 Billion in American profits from China is MANY TIMES that of the profits on China’s exports to America ($300 Billion, with profits averaging 1-5%). More equitable trade means equal profits. in terms of what comes onto the U.S. short by the trade deficit, you're smokin' something. It's not hostility, it's trying to keep U.S. manufacturers for the U.S. economy. I don't buy that 2.5%, 1.5% profit margins. If you want to claim U.S. MNCs and financial sectors are playin' both sides of the fence, not only screwing over the U.S. economy and the U.S. worker, but additionally China, I'm sure we could argue that to truth, but in terms of what is tabulated by the BEA and U.S. Customs, this is not so. From reading the China trade reports, that's not so either. Deal. Ideas are $$, big money and it also takes big $$ to develop those ideas, that innovation. All these big corporations are so gung-ho to lay Americans off, squeeze more work out of courrent staff, outsource, get in cheap foreign workers. If Profit is King, then why deal with China? I presume in other low-cost countries these issues are present but not as bad. I know China is not cheapest anymore. FOXCONN, which has become the poster boy for exploitative, cheap labor in China, has just delisted and is reporting a loss. Yes, a loss, while having the contract to make the most popular cell phone and tablets, Apple products. Previously our Chinese friend claimed these exporting Chinese manufacturers were making only a 2.5% profit margin. Now overall, no way, but in terms of slave labor conditions in China, I can believe it. It's not just Foxconn with horrific working conditions, there have been many stories of slave labor, barracks, working 120 hours a week and getting shafted on meager pay in China. That said, if you go to Silicon valley, almost any engineer, they too are working greater than 80 hours, sometimes 120 hours a week with a salary that is supposed to be 40 hours and vacation that one dare not take. That said, IP theft is a different story. Foxconn is a manufacturer, which has the Apple contracts. The actual IP, design is coming from Apple. Now argue what you will on that score and watch the patent wars in Cell phone land all you will, but Foxconn has no rights to Apple's intellectual property. Apple, on the other hand, do you think it's just so cool that your iPhone has blood on it's hands? If anyone has calculated how much more the iPhone would be with the same profit margins, but manufactured in the U.S. with solid wages, I'd like to see it. Anyway, that 2.5% profit margin on average, he has to be referring to production, manufacturing, outsourcing in so many words, where multinationals do exploit workers...they exploit any worker, whereever they can find their mega cheap labor, be it in China, Vietnam, Brazil or Romania. There is no question that America has a problem. But scapegoating China or anyone else externally is not going to do anything for Americans. China's entire trade with America is only about $300 Billion. To put that in perspective, after the 2008 debacle, instead of throwing the banking frauds in jail and confiscating their trillions in ill-gotten wealth, instead Washington forked over another $2.5 Trillion in illegal subsidies to the financial "industry" (one which manufactures only fraud). Now if instead giving that money (that Americans don't have, ironically) to the banksters, if just half of that was spent on American infrastructure, today America would be running full employment. WHOSE fault is that? You can't blame the Chinese on that one. The Chinese have no vote on how American pols spend trillions that Americans don't know that they have, to be paid back by many future generations yet unborn. It IS the system. The talk about the superiority of democracy, of being able to get rid of nonperforming leaders, is illusory, when all the leading elites BELONG with and are part of the same kleptocracy. Last comment from you, misinformation troll. The trade deficit with China is $300 billion, by fast the largest. trade deficit report overview has the graph. There are 3 million documented jobs lost to China from 2001 to 2009. Hello, I love it when evidence is overwhelming various agenda interest trolls come around and claim it's scapegoating. Our government maybe suckers but this site is not and it appears neither is the USITC commission. and this report is just on IPR, we haven't even linked to the many others on currency manipulation, dumping, manipulation of one's VAT, tariff schedule and other unfair trade tactics coming out of China. Your last comment China troll, for you appear to be trying to post so much misinformation, including trying to throw out false statistics in this post. I'm sure you have some sort of monetary agenda, maybe a China importer, or EE trader or whatever, but go find a fictional refuge, something perhaps from CNBC, for this site ain't it. Be sure to claim that by outsourcing American jobs we benefit through cheap plastic goods and such. Yeah, right, a $1000 yearly savings really equals a $50k a year job. No more misinformation allowed, this site is reality based. If i was a business, this doesn't sound bad at all. I could go to china, use ripped off software and computers, equipment, everything cheaper, plus cheap labor, and make a boat load. What does Dell care if their security software is a rip off of Norton? they only care because it's 80% cheaper! Great stuff currently here at EP on trade issues. Not the least of being the hilarious world map at the top of Robert Oak's column! But we tend to forget in these discussions what I believe may be of huge importance, namely, the effects of transfer pricing. There is much more awareness of these issues than there was just ten years ago, but work cited here by Lorraine Eden is still a very solid introduction to the topic, IMO. Most governments keep balance of payments statistics on exports and imports, by value, and construct international prices indexes in order to deflate these statistics. How can intrafirm trade, trade between related parties, bias the construction of these international price indexes? Does transfer pricing, the prices of products traded between related party firms, bias the export and import price indexes in any predictable fashion? If firms manipulate transfer prices to avoid taxes or tariffs, what is the appropriate transfer price to use in constructing export and import price indexes, in theory and in practice? These issues are important because related party trade is huge, representing half of US imports and one-third of US exports, and perhaps a third of worldwide merchandise trade flows. This paper explains how transfer pricing and intrafirm trade can bias the construction of export and import price indexes, outlines and evaluates the various prices that could be used to construct these indexes, and makes some recommendations for the international price program run by the US Bureau of Labor Statistics. We can easily see with minimal investigation that transfer pricing is the key to solvency of nations in a world of globalized trade, which surely must bear some relation to Adam Smith's concept of the "wealth of nations." 1. Instead of trying to collect money later based on complex rules, all subject to dispute in tax courts and interpretation by IRS auditors, let's get a reasonable amount up front. 2. Of course, the import price may be manipulated downward but then how does the importer (or some entity farther along the supply chain) avoid the squeeze that the less paid per item up front, the greater the net taxable income? 3. The across-the-board tariff (or 'VAT') should replace all the special preferences and subsidies, thus eliminating opportunities for political corruption and also providing the necessary stable and predictable business environment that fosters true free enterprise capitalism. 4. Let's say that all the multi-nationals settle for the minimum import price that the IRS will allow and then somehow avoid paying their corporate taxes. Okay, we (U.S.) still have received enough income to at least assure that domestic tax-paying producers are not in effect subsidizing, against their own interests, foreign competition that effectively pays no taxes or duties of any kind. 5. We (U.S.) have them in a squeeze play. Somewhere in the game, we should be able to tag out the cheaters. 6. The "free" trade trolls (noted by Robert Oak) will object that the public will have to pay more. That is one of several arguments used over and over that always amount to that no corporation should ever pay any taxes, imposts or fees of any kind. 7. As for the argument that corporate taxes amount to double taxation, since dividends and such are presumably taxed -- we could allow corporate taxes a pass-through to the benefit of long-term investors who pay taxes within the U.S., thus rewarding savings and investment rather than gains from casino-like trading scams. 8. Finally, they say, China will retaliate. Good for them! They have been showing a lot of sense for some years now in their trade and monetary policies, more that us (U.S.)! Also, our action would bolster their confidence in their holding of U.S. government notes. Let all nations adopt the 15% across-the-board tariff and stop the ongoing trade wars that enable political corruption! Australian dollar is at unprecedented high, average household debt is 150% of household debt for U.S., and, they may be looking into the maw of a collapsing housing price bubble. Government stats can be read as showing rising savings, but actually represent rising debt service. Dobbie recommends TARIFFS, criticizing the entirety of "classical" economic theory (including, I believe, "free" trade theory). Meanwhile, I wondered, what about Australia's public debt? Remember, it was negative not too long ago! So, I did some googling research. CIA figures show Australia's gross public debt (2010) as up to a little over 1/5 of GDP, U.S. at 3/5 of GDP, while Japan is at 225% of GDP (and that's pre-Tsunami)! But these figures (the ones usually cited) are not as reflective of reality as figures for net public debt. Here's a great link to an excellent paper (PDF), focused on Australia but also on G7 and the topic of gross versus net public debt. But seriously, you're writing some great information and if you could formulate your thoughts and references into a cohesive piece, I'll help you format it and put it up as an article. Email me offline, through the contact form. Transfer pricing is extremely complex as a topic and very few even know about it, much less have a handle on it. So a goal would be to boil the BEA down to Blogger/Speak/English to teach, explain. Zhuubaajie is either a Chinese nationalist troll or member of the famed 50-cent party. His antics on the Huffington Post business section earned him an entire article dedicated to China's paid internet "contributors". I've got into countless arguments with the guy who has an severe intolerance to the slightest bit of criticism toward China; his common approach is to try to twist it into criticism toward America. Anyway, I completely agree with your article. America's trade arrangement with China is utter stupidity. It's not a secret plan or conspiracy it's out in the open for all to see. If China designates a company of strategic interests it forces producers to move manufacturing there, form joint ventures, and pass over trade secrets. Chinese state run companies actively harass foreign companies to shut down and move to China using their connection to China's state run banks to effectively bribe our companies with subsidies. On top of that you'll see a noticeable increase in hacking attacks directed at intellectual property rich industries in technology rich fields and Chinese students gaining graduate student visas. Unfortunately some of America's greatest companies are run by short sighted baffoons lacking the technical ability nor innovative history to see that the only thing that keeps their company viable is their trade secrets; they follow the Wallstreet mantra that losing the ability to produce for yourself means less risks. There are a few companies like Intel that have worked to hold back their most sophisticated production but then there are others like GE that likely will be out of business within the next decade (unless given a major bailout). The way I see it, only two things can put an end to this: a reciprocal trade policy or financial crisis in China. Business interests are holding up reciprocal trade policy for now; but it's looking increasingly likely China's bubble will pop and business will be scared away not by things they don't understand like the value in intellectual property but things they do understand like exposure to toxic assets.